mHero is a two-way, mobile phone-based communication system that uses basic text messaging (SMS), interactive-voice-response (IVR) or mobile device applications (e.g. Andoid) to connect ministries of health and health workers. Communicate critical messages to health workers during a crisis or emergency response. Target messages to health workers based on cadre, location, or skill set. Collect critical information that powers resilient health systems, including stock levels, routine and one-time assessments, and validation of health worker and facility data. Provide care reminders and manage client referrals to strengthen clinical support. Status: mHero has been deployed in several countries. However not all APIs are standards based. The intent of this workflow is to move all APIs to standards based APIs and options are provided below. Point of Server (POS). This is the initiator of an mHero data collection workflow. It is responsible for selecting a cohort of health workers and a data collection activity to perform with that cohort of health workers. The results of the data collection are expected to be analyzed according to its particular business needs. 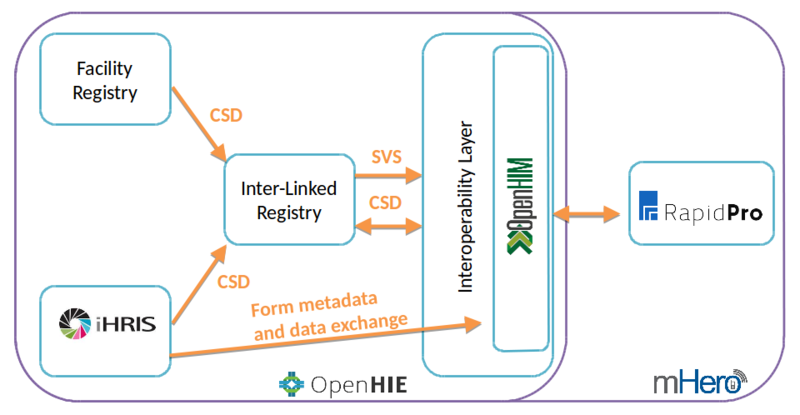 Example is iHRIS and the OpenHIE HWR Management Interface. This workflow is closest to the current state of mHero implementations. In this workflow, the mHero Data Collector is responsible for importing health worker contact information and providing local identifiers back to the health worker registry. It is expected that the mHero Initiator Collector has some awareness of the available mHero Data Collectors.